Escape The Fate and Attack Attack! have announced a co-headline tour, that starts on April 5th. They are dragging The Word Alive, Secrets and Mest along for the ride as well. There is also more dates to be added to this one, so keep you're eyes peeled. You can get tickets and more information here www.thisworldisourstour.com. 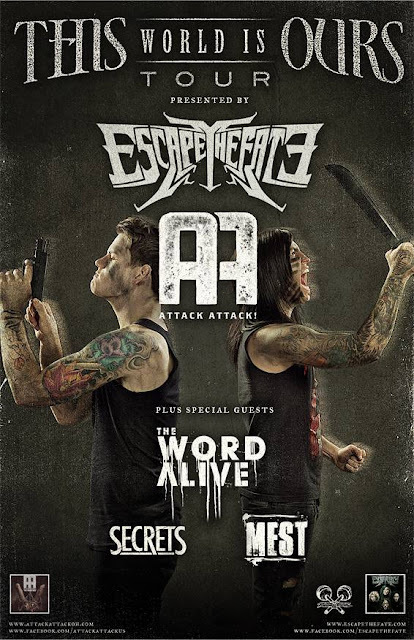 Also, visit Escape The Fate at www.facebook.com/escapethefate and Attack Attack! at www.facebook.com/attackattackus for more information.